CheckIn from University of St Mark & St John on Vimeo. When a student Checks In to a timetabled session by scanning the QR code in the room data is pulled from their timetable, inline with the room they are in at the time, to Check them into their session. As a result of this errors in the outputted data may occur when students CheckIn to a different room or when their timetable does not match up. The CheckIn dashboard gives you access to the records for student CheckIns, accessible by Lecturer, Room, Module, Date and Student. From the main dashboard page you can select which option you would like to view the data by. The example below shows looking at the data by a module and then viewing the attendance record for this module. From the dashboard, select the Module button and use the options along the top to select the module. This will display a list of the CheckIns for that module and at the top of this list there will be a link to view the ‘Attendance report’ for this module. This link will take you to a separate page (you may need to put in your login details again on this page) this will display the attendance report for your module. This report is exportable in a various formats from the top menu. Student’s are able to CheckIn to PDT sessions using the QR codes supplied to the tutors. This code does not rely on a timetabled event to Check them in, this allows them to CheckIn to any meeting held with their tutors and to input what they are attending. To find student CheckIns to PDT sessions, you can search in the dashboard using the Lecturer option and selecting to view Non-timetabled sessions only. This will bring up a list of anytime a student has CheckedIn to see that lecturer in a non-timetabled session. You are also able to view whenever a student has CheckedIn to a non-timetabled session by viewing the data by student and selecting the Non-timetabled session option. To access an attendance report navigate to the specific module/student and click on the ‘View attendance report’ link. This will take you to the information system, as a result you will need to log in again with your normal log in details. This will visually display the CheckIn data. For a module this will show a list of the students expected to attend with colour coding indicating whether they Checked In to the session. A White square will show that they were not expected to attend the session, Red will show that did not CheckIn to a session and Green will show that they did CheckIn to the session. This report is designed to give staff an easy way to identify whether a student is attending sessions as expected. The CheckIn system pulls data from the student timetable to match up to the room they are in at the time of CheckIn, if a student Checks In to the wrong room, or at an incorrect time this will stop the system from Checking them in correctly. The system is set up to allow for CheckIns 10 minutes before the session, but any CheckIns before this time may mean they are not registered, as the CheckIn time will not match up with where their timetable expects them to be at that time. The engagement report pulls in 3 indicators of engagement into one RAG rated report. You can use the buttons at the top of the report to filter it by either programme or personal development tutor. You are also able to customise certain aspects of this report, see below for details. By default the engagement report will show you a list of all programmes with RAG ratings, to filter this you can add your programmes to your watchlist. The options at the top allow you to choose between viewing ‘All courses’ or ‘My courses’. The ‘My courses’ option will show you only those you have added to your watchlist. 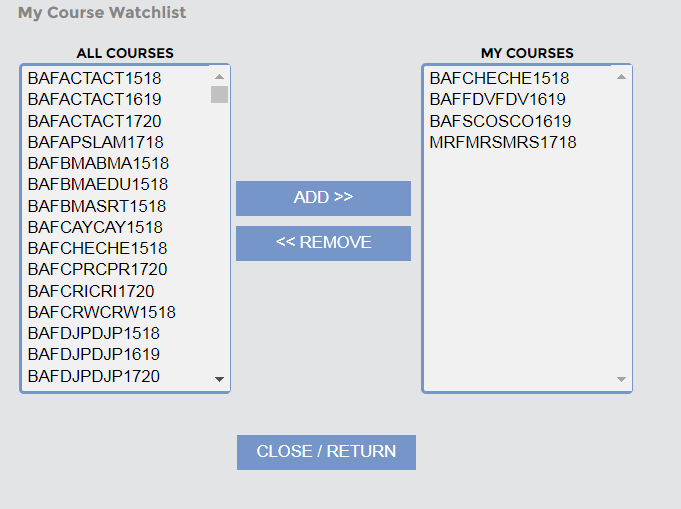 To edit the watchlist, click on the ‘Edit my course watchlist’ button and this will take you to a page showing all courses on the left and courses in your watchlist on the right. Use the Add and Remove arrows to move courses from the All courses list into the My courses list. When you click Close/Return you will be taken back to the engagement report and you will now see only the courses in your watchlist by default. The RAG rating values are set by default by the system, and will highlight Amber or Red depending on certain levels of engagement across all 3 indicators. From the ‘Edit my course watchlist’ page you can change the point at which a students engagement will be highlight Amber or Red. This will stay your default setting unless you change it again later. Please note: The ratings are set to look across all of the indicators. This means that the RAG rating will only show when the warning interval has been hit for all 3 indicators. CheckOut was trialed in Semester B of last year and allows students to give instant feedback on sessions. Following this trial the feedback questions have been modified. 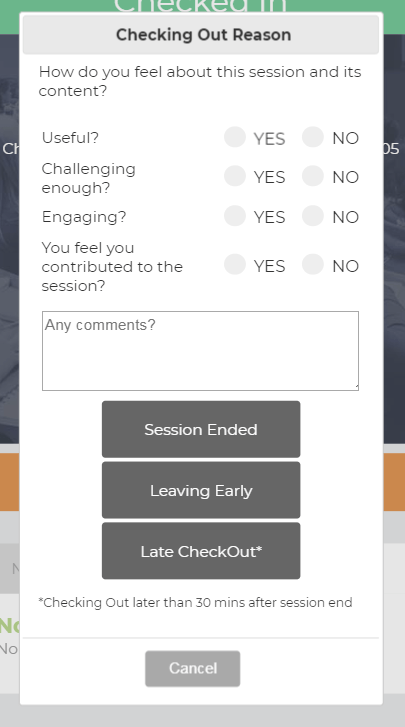 Once a student has Checked into a session they will be given the option to CheckOut, on this screen they can answer set questions, give text feedback and select the reason they are checking out. This feedback is made available to staff through the Checkout data dashboard on a session by session basis. Go into a specific module in the data dashboard and view the session to see the Checkout responses.